Papua New Guinea coach Flemming Serritslev was elated to see his side lift their game against the Preliminary winners to secure an eight goal haul, and with it the honour of top spot. Serritslev’s charges looked dangerous from the outset with Tommy Semmy, Michael Foster, Raymond Gunemba and Nigel Dabingyaba forming a four-pronged attack that kept Samoa’s defence well occupied. Keeping Samoa in the game early on was the impressive Ted Sikovi who came into goal for the Polynesian side and more than earned his start as he denied the quartet time and again. Despite being under the pump, Samoa managed three shots on goal in the first half, with one of those on target to test Ronald Warisan in goal for the home side. However with Papua New Guinea putting relentless pressure on their opponent’s defence it wasn’t long before they had their opening goal courtesy of Michael Foster who sent the ball between Sikovi and his post. 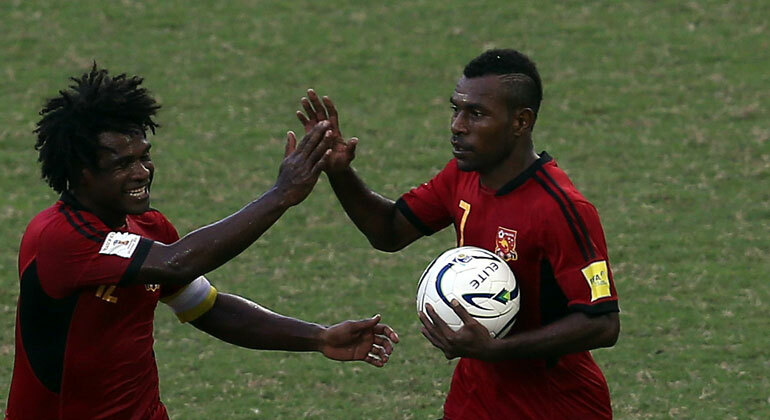 Foster’s Lae City Dwellers teammate Raymond Gunemba added to the scoring with an impressive solo effort 33 minutes in to give Papua New Guinea a 2-0 lead going into the half-time break. A stern talking to from Serritslev during the break combined with the continued backing of the vocal home crowd buoyed PNG’s second half performance as Foster had his second five minutes after the restart. Nigel Dabingyaba and Koriak Upaiga both got on the score sheet while two more to Gunemba saw him take home a hat-trick along with the win and a spot in the semi-finals. “We played terribly in the first half,” Serritslev says of the performance from his side. “And I told the players at half-time that it’s actually the worst first half I’ve had with the team since I’ve been with them. PNG captain David Muta credited the supporters with aiding the side in getting the job done this evening. For Samoa coach Scott Easthope it was a disappointing end to the tournament, but he says he can’t fault the effort from his charges. “They definitely gave everything that they could right until the end physically, and they just ran out of gas against a side that’s far superior – and that showed later on. The final match of the group stage had defending champions Tahiti take on New Caledonia in a winner-takes-all rematch of the 2012 OFC Nations Cup final. Knowing a place in the semi-finals of the Oceania’s most prestigious international competition was on the line, both sides threw their all at this encounter. Les Cagous of New Caledonia made a strong start with several early attempts on goal with a lot of the attacking threat coming from Roy Kayara who kept Taumihau Tiatia busy up the left as he surged forward with pace and desire. It proved equally as busy at the other end of the field for Jelen Ixoee as he tried to contain the pressure from Alvin and Teaounui Tehau whose combined skill and power proved difficult to close down. While New Caledonia enjoyed 64 per cent of possession in the first half, the two nations both tallied nine shots, although Tahiti’s five on-target was a much better statistic to take into the break than their opponents single on-target effort. The back-and-forth continued in the second half as the Francophone sides tussled for dominance before former OFC Player of the Year Bertrand Kai stepped up. The striker received the ball with his back to goal, turned to face and drilled low, creating a chance from nothing to surprise goalkeeper Mikael Roche. Tahiti coach Ludovic Graugnard spoke of the strong mentality of his players to come from behind against Papua New Guinea several days earlier, and they once again had to call on that strength as they found themselves facing an early exit from the competition. Tahiti left it relatively late but when they hit back it was with impressive form as Teaonui Tehau back-heeled past Ixoee in the aftermath of a corner to pull Tahiti back in line in the second minute of additional time. A late shout for a penalty could have seen Tahiti pull ahead, however the claims were denied by referee Nick Waldron and Tahiti were left to rue their numerous missed chances as they watched New Caledonia celebrate passage to the semi-finals in their place. Graugnard was still reeling after the match as he considered what might have been. “We didn’t score enough in our first game,” he says. “Tonight’s match was incredibly open, it could have been one or the other and both sides had a lot of real chances that went amiss. On the other side of the coin, New Caledonia coach Thierry Sardo was elated his side is progressing to the semi-finals. “The objective was to make it through the group stage and we’ve done that,” he says. In the semi-final match ups New Zealand will take on New Caledonia in the opening match at 4pm on Wednesday 8 June before Papua New Guinea play Solomon Islands at 7.30pm at Sir John Guise Stadium in Port Moresby.